This year, one of the highlights of the 8th annual Ponderosa Stomp will surely be the reunion of Cyril Jordan and Roy Loney of the Flamin' Groovies. As the twin creative engines behind the original Groovies line-up, Jordan and Loney took the concept of greasy, good-time, high energy rock & roll to its face-melting limits, and created a template for countless underground American bands in the process. But Jordan and Loney haven't shared a stage since 1971. 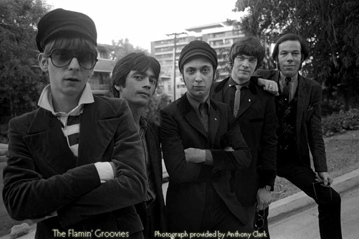 Loney and Jordan are founding members of the 60's San Francisco Rock group The Flamin Groovies. The widely influential FG's incorporated elements of 50's Rock & Roll and what eventually became known as Power Pop into their sound. The A-Bones are a Brooklyn based garage rock band, founded by Miriam Linna & Billy Miller, who also founded Norton Records. Besides their own excellent releases, they have also backed up Hasil Adkins, Ronnie Dawson, & Cordell Jackson.